Classic Bamboo Pintail Gold Coast Longboard Review- Is It Worth Buying? We will introduce you with an awesome longboards that is a great one for cruising. It’s Classic Bamboo Pintail Gold Coast Longboard. You will know the features and specifications of this board with its pros and cons. You will also know why it’s different from other brands. 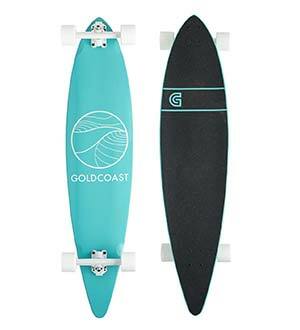 This article will give you a complete gold coast longboard review of each part of the board that will make your decision easier. You will get enough good reasons why you should buy the gold coast longboard. 2.1 What make the differences between goal coast and other brands? Product dimensions: The longboard length 44 x 10 inches with the floater shape and it weighs around 1 pound. Construction material: It’s constructed from a hybrid of 5 ply bamboo and maple. Deck material: The deck of the longboard is made from seven-ply Canadian maple. Deck dimensions: The dimension of the deck is 44 inches long by 10 inches wide. Wheelbase: The length of the wheelbase is 26 inches. Wheel size: It has wheels of 71-millimeter size. Durometer of each wheel is 80a. Genuine gold coast ABEC 7 bearings with Teflon is used. Trucks: Century 7-inch or 179mm reverse pivot trucks are added to the longboard. Grip tape: The longboard has grip tape with unique print and clear die cut. Bushings: 86a barreled bushings is applied. 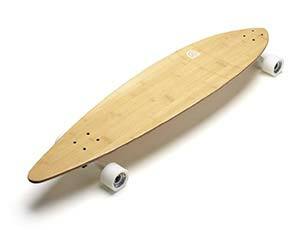 This classic bamboo pintail longboard with floater shape is specially made for cruising. The 7 ply maple construction of the board allows you to have a very responsive ride. All the components are held together with a nicely printed grip tape. The dimension of the board is 44 by 10 inches with a wheelbase of 26-inches length which provides you a smoother ride and more stable carving. With the 7-inch reverse pivot trucks of the wheels and ABEC 7 Teflon bearings is just awesome for maneuvering and riding downhill is also much comfortable with it. The boards have 71 mm Shred Boot wheels with a hardness of 80a that can help you to get over the bumps very easily. You can also take it to your school or college campus and perform many tricks with it on your sidewalk. This board will fulfill your needs in both cases whether you want a traditional board or a modern one. The board is less expensive, so anyone can afford it. It’s perfect for casual flatland riding. All essential parts are already included, so no need to add extra components before using. The initial setup of the board doesn’t aim at riders of advanced level. For heavier riders, the 5-ply deck of the board may not be good enough. What make the differences between goal coast and other brands? The brand has become an icon for the awesome graphic of the classic longboards. The perfect combination of the printed clear die-cut grip tape on the wood makes the design unique. The board is constructed from a special hybrid of premium Canadian maple bamboo that makes sturdy and it becomes a great board for both beginners and expert riders. It's one of the best selling products over the last ten years for the timeless clean pintail that any rider will expect in his board. The "W" concave shape on the pintail helps to make your sweeping carves smoother by giving better leverage to your foot when you ride downhill or during you maneuver. You can go anywhere anytime with this board. This board is basically made for cruising which means the riding discipline of rolling around effortlessly on any board with wheels anywhere. It also great for downhill riding with it and perform regular tricks of cruising. But it may not seem to be perfect for extreme tricks. Among these uncountable number of styles and designs available, one design has always been desirable to the riders. The signature tail and tapered nose of this classic board help the riders in fast and easy carving and maneuvering. The combination of the narrow pintail with wider central platform makes a great board for moving on. The smooth and charming shark-like shape of the board combined with aerodynamic design gives it an eye-catching stylish look with simplistic beauty. High-Quality materials are used for the construction of each component. Here we give an overview of the parts of the boards. The design of the longboard deck varies for different riding styles. The board is constructed from 5 Ply Bamboo and Maple hybrid that makes it much strong. Seven-ply Canadian maple is used for making the 44 inches long and 10-inch wide deck which makes the deck sturdy and sustainable even in hard carves or turns. Shred boot wheels are used in this longboard. The 71mm Shred Boot wheels with 26-inch wheelbase and the larger size makes it easy to avoid obstacles. Century 7-inch or 179mm Reverse Pivot Trucks of this classic board makes it much better. The genuine gold coast ABEC 7 bearings of the board make more durable and smoother for riding. Consider the materials used in constructing the decks, wheels or bearings and make sure they are of good quality. The trucks should be strong enough so that it doesn’t bend while tough tricks. The wood of the deck should be flexible enough to push, pump or slide it easily. The size and durometer of the wheel should be matched to your intended purpose and the bearing should be able to roll the wheel smoothly. If you don’t get any type of technical secs from the suppliers of the boards, then we will suggest you to avoid purchasing that complete setup. Q: Is this a good brand? A: Goal coast is a renowned brand founded in 2009 and till then it’s producing good boards. With the good quality product of popular shapes and sizes, they also ensure the shipment of product to almost anywhere in the world! Q: What will need to adjustments for this longboard? A: You can use it directly out of the box as it’s a board with complete setup. You may have to make some adjustment of the trucks and the wheels for best comfort. Q: Can beginners use this board? A: Obviously, you can use it as a beginner. As the board is supplied with a complete setup, it's easy for the beginner to start using. We have tried to give you a Gold Coast longboard review. Now it's up to you, what to choose for your best riding. It's not always true that only very expensive products give high performance. First of all, figure out your requirements and then it will be easy to choose the best board for you. If you want to be an expert and regular rider then you should invest more. But only for spending your lazy hours in longboarding it’s enough to choose an easy- affordable board with good features.